There are a lot of admin tools for Smart Office and sometimes it is hard to keep track of them all. So I thought I would give you an overview of the admin tools, where to find them and what they are for. There is more information in the Admin Guide. I’ve also got a special request to document the URIs for all tools. Please note that you can check all the URIs to tools in the Navigator widget by dragging them to the canvas to create a shortcut – then right click for the context menu – and select settings. The URL is what you need to launch the tool or form directly. It takes a lot of time to write a post like this and Sofi was kind to help out so this is her first post on the Smart Office Developer blog. The following tools are part of Smart Office 10.1 and 10.2 and covered in this post. M3 and Lawson admin tools will be covered in a later post. The Administration guide will be updated with the Uris as well. They might come in handy if you have configured what widgets to allow and you forgot the Navigator. Just remember that you can always just search for the program name in the start and search field. The first three tools are the ones you are most likely to use. 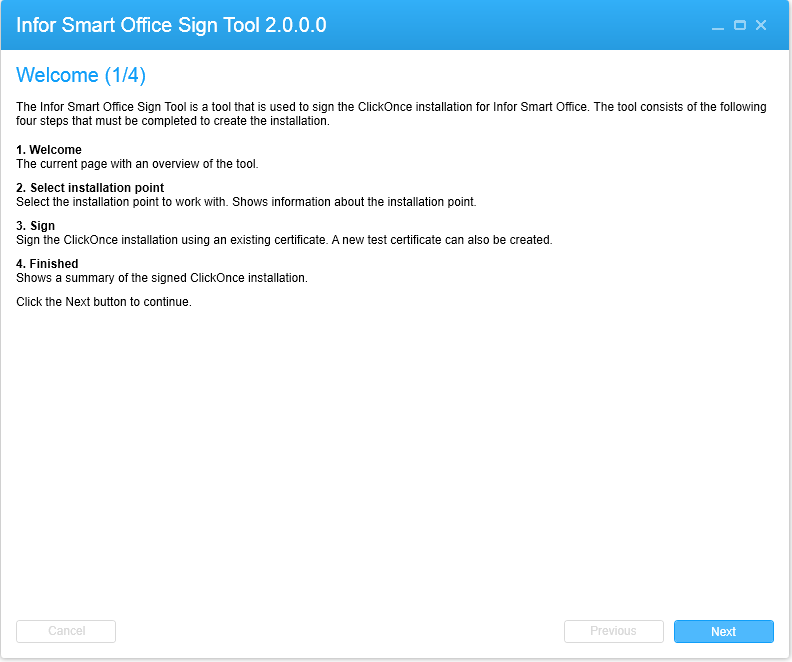 The Sign Tool is used to sign the Infor Smart Office Installation Point. 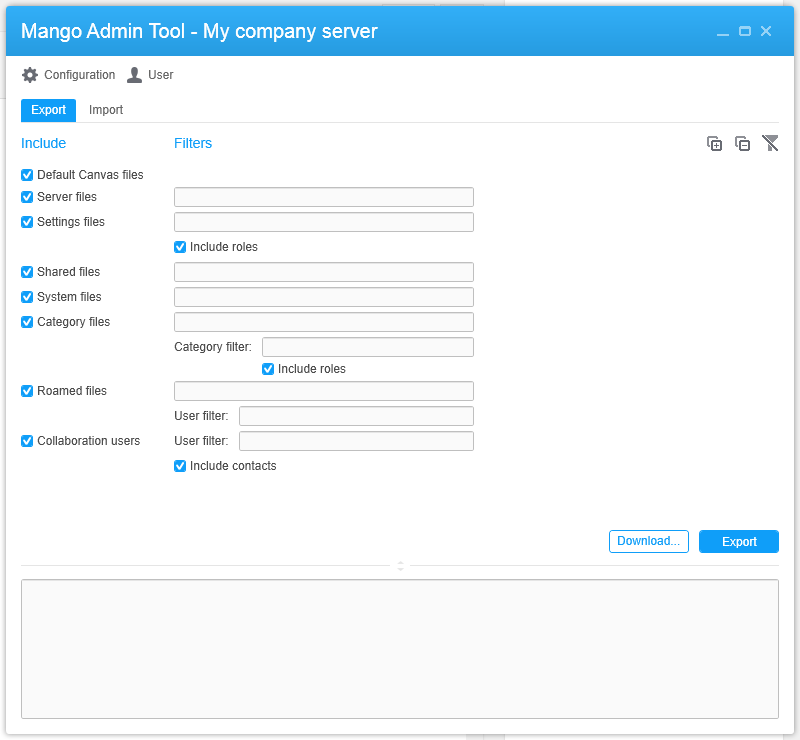 The Mango Admin tool is the import/export tool for all kind of server data. The Infor Application Builder is for packaging .lawsonapplication files and you only need it if you re-package like multiple mashups into one installation package. In most cases you will simply create the .lawsonapplication file directly from the Mashup Designer and if you build features with the Smart Office SDK. These are the tools that run within Smart Office. You can find more information in the Infor Smart Office Administration Guide. Default canvas files – The default canvas file for users. Not possible to control based on role in this tool, but the default canvas setting in properties (filename) can have a rule so you can have different canvas files per role. Shared files – system files. Not role based. System files – Not role based. The Startpad File Administration is just a specific view of the Category files tool. Startpads can be connected to roles and users so they are a great tool for pushing out Startpads to groups of users. None – No users have access to the mashups in the mashup project. Public – The mashups in the mashup project are available to all users. This is the default access level. Role – The mashups in the mashup project are available only to connected roles and users. To allow a user access to a project you need to add the user id of that user. Except for administer user access right you can also upload (New..) a mashup or update a mashup by browsing for a mashup file. Mashups can also be exported and deleted. 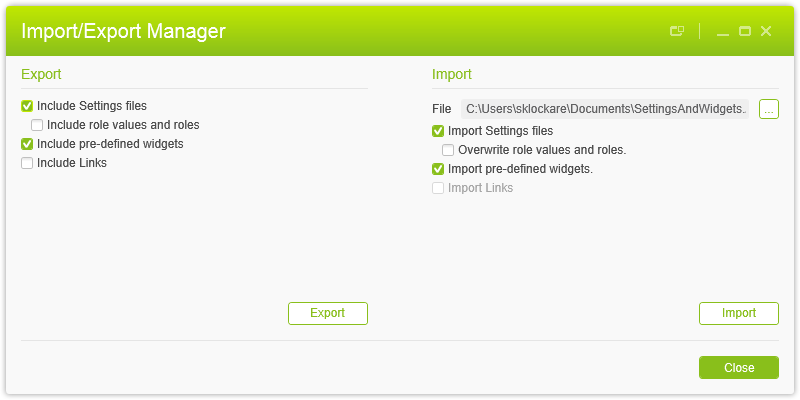 In the Import/export Manager you can export and import settings files, pre-defined widget definitions, and links. You should always use this tool if you have Lawson Info browsers since this is the only tool that will handle the extra meta data that is stored in the Lawson backend. But for Smart Office 10.1 there is a stand alone Mango Admin tool that can export/import all of the data that we have on the Smart Office server. Include Settings files: These are the settings maintained in the Settings Editor. Include role values and roles: If selected, role data will be included with the setting information and this data will overwrite what is on the target server when the import is performed. Include pre-defined widgets: If selected, data about pre-defined widgets will be included in the export file. Include Links: If selected, links that have been set up at your site are included in the export file. To import the data you first select which .zip file to import. Then you should select the checkboxes of the options that you wish to include in the import. Only available options will be enabled, so if for example links are excluded during the export, the import links option will be disabled during import. In most cases, when the zip file is imported, the content of the files will be merged with what already exists in the database. The exception is role values and roles, which are overwritten with the new information if that checkbox is selected. Overwriting is done on a per-settings-file basis. Unknown settings, such as settings that don’t exist in this version of Smart Office, are ignored. If you only wish to export and import Links between users I recommend you to use the Link Manager instead. Depending on your Smart Office version you can also import/export the M3 / Lawson link file in the Category File Administration tool. There you simply download the XML directly from the tool and you can update it as well. What tool to use depends on what version you have. The import/export tool was added in 10.0.5 and after that we added the export/import functionality to the link manager. Those two tools will automatically update the cache on the server with links as well but you need to restart the server if you use the Category Files Manager (for links). 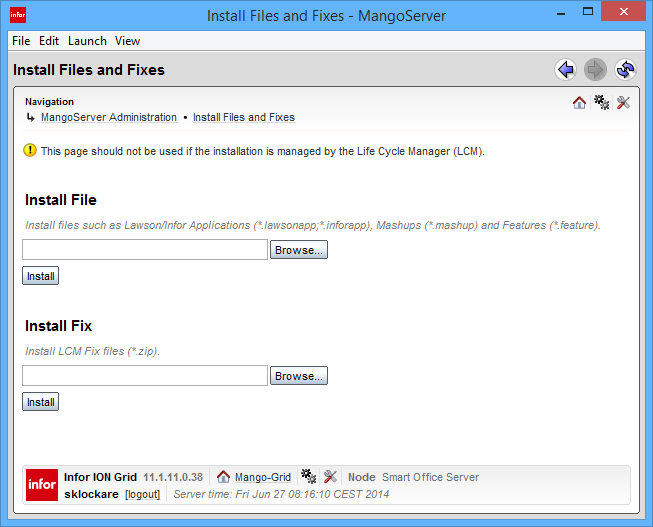 The Installation Point Manager is used to deploy features to a feature folder. By default, there is only one feature folder (named “default”). Multiple feature folders should be used if, for example, you have users with a poor connection to the Infor Smart Office Server, or users who do not need to use all the features in Infor Smart Office. Within the Installation Point Manager you can select any of the available feature folders to see Deployed Features, Feature Repository and an Error list. Most customers only use the default feature folder. It is still good to check this tool to see what features are made available and if you have any validation errors. A typical validation error is that you have enabled some features but they are dependent on another feature – that is not enabled. So this tool is good to know for troubleshooting. The Deployed Features lists the features that have been deployed to the selected Feature Folder. The Feature Repository lists features that are available for deployment. 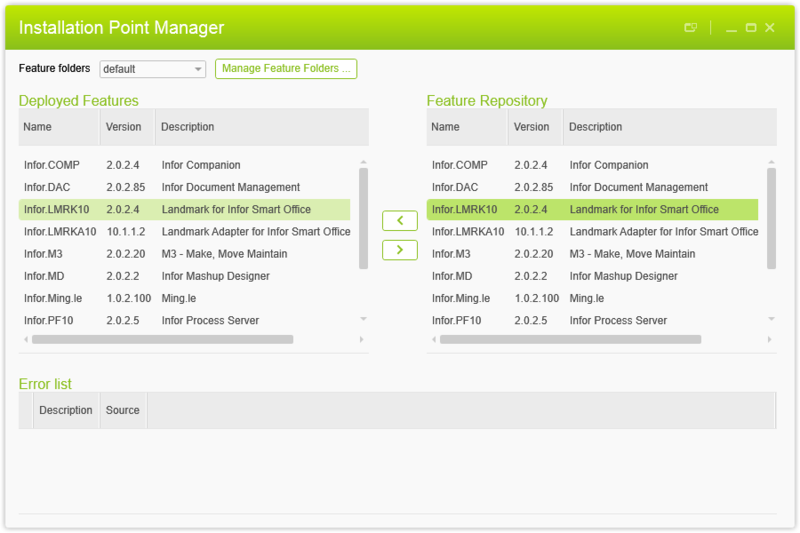 Features are loaded into the repository when you install an Infor Smart Office service pack or hotfix, or when you deploy a Lawson Application which includes Infor Smart Office features. The Error List shows any configuration errors. For example, if a feature depends on another feature that does not exist in the Feature Folder, the error will be displayed in this list. You can create a link from an object in a form to a URL on your corporate intranet or the Internet. This type of link does not require Infor Document Management. 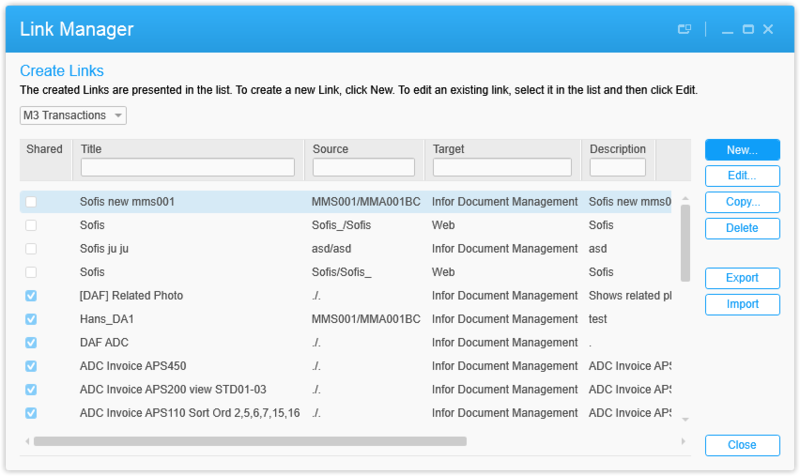 You can also create links from M3 objects to documents stored in the Infor Document Management. The links use data that you provide to search the Infor Document Management for objects that match your criteria. You can set up a link to find multiple documents of multiple types. When importing, you might have to select if you want to overwrite duplicate links before proceeding. If you choose not to, those links will be skipped. 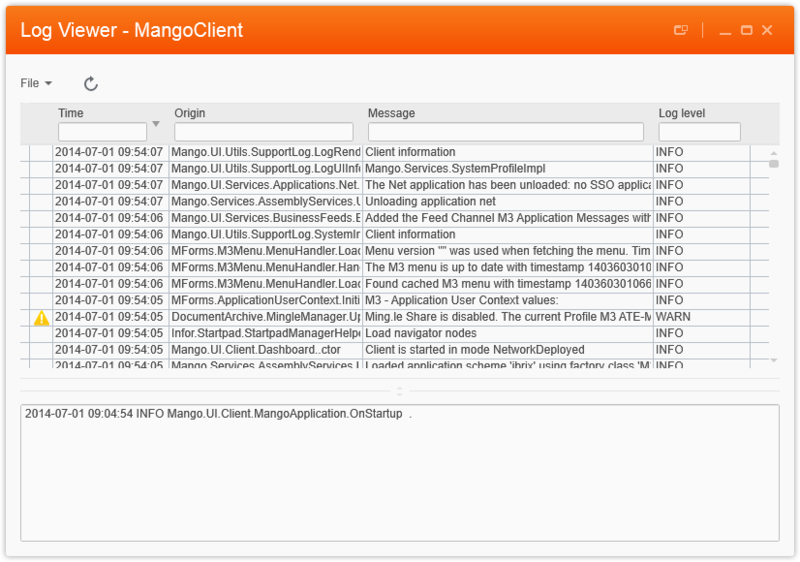 The Log Viewer shows recent system log entries for Infor Smart Office. When contacting support always open the log file externally and save it. Don’t take screenshots :-). In Smart Office 10.2 there is also a Log Widget that will show you logs in real time. Great for developers and trouble shooting. In versions where the Log Viewer is not available you can find the log by clicking on a link in the About Smart Office page (under Show or Help menu on the Canvas). Title and description should always be set, and you can also translate the title and description to other languages by clicking the add button below the localization table and then selecting the language and adding the translations. When you create new predefined widgets, the widgets will automatically be made available in the Widget Library. It is possible to manually define more widgets than the ones listed above but then you need to manually edit the file (and restart the server). 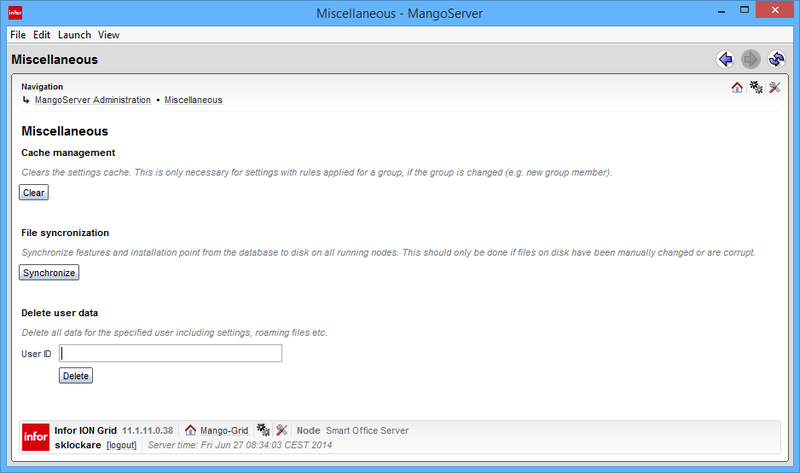 To edit the file you need to use the Mango Admin tool select the System files category and the file name is WidgetSettingsDefinitions.xml. Change the file in the zip and then import it again – and restart the server. What values to use for different widgets is documented in the Smart Office Admin guide. I would not recommend this approach but you might want to try it if you are developing your own widgets and you haven’t implemented the interface IWidgetMetaData that is needed for the widget to work in the Predefined widgets tool. The Profile Editor is used to create and edit system profiles. A system profile can be viewed in two ways: Basic or Advanced. 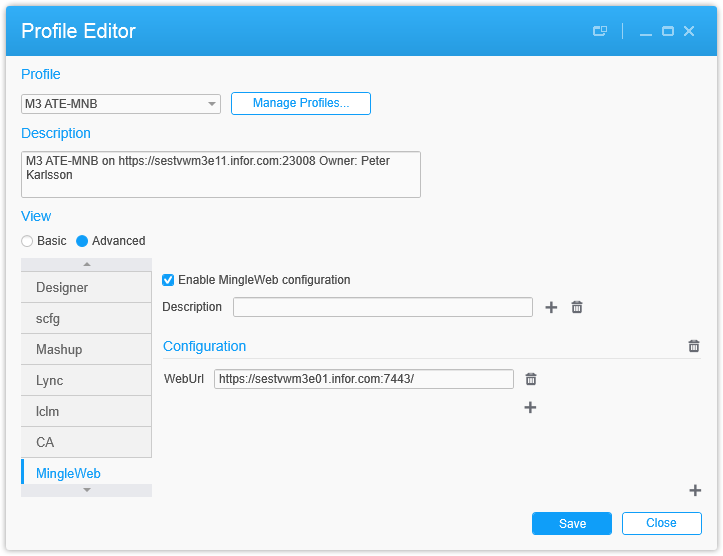 The Basic view consists of application-specific configuration fields. 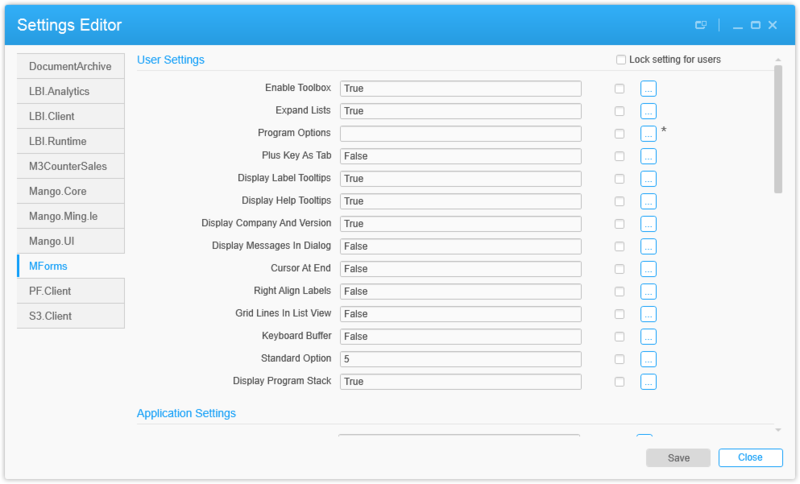 Each basic profile screen provides the minimum configuration required to create a system profile for the application. The Advanced view shows more detailed configuration information for each application. The fields are always the same as in the profile.xml file. For some applications, the Advanced view has the same options as the Basic view. At the top of each application configuration view is a check box that allows the application to be enabled or disabled. When an application is disabled (the check box is not selected) it will not be available to users. In the Manage Profiles dialog you can create a profile by clicking new or by copying an existing profile. In this dialog you can also import and export individual or all available profiles. The profile information is stored in the GDBC database in the table CategoryFiles. As an administrator you can also import and export the file within Smart Office using the Category Files Administration tool or through the standalone Mango Admin Tool (found in Additional Files folder of the installation package). User Settings can be changed by users in the Infor Smart Office Settings dialog. To prevent the users from changing a value, the administrator can select the Lock Setting for Users checkbox for that setting. This will replace the users settings value with the default value set by the administrator. Application Settings can be changed only by an administrator. 1) Display name retrieval is not working with the session provider. There is a Grid Management page for the Session provider where you can test this. 3) The display name (pre 10.2) is only kept in memory so the user has not logged on since the server was restarted. In 10.2 we do not have the display name – only the user id is shown. The plan is to get a service for listing display name or to remove the column from the tool. In the Videos Manager you can provide tutorial videos. You can add a path to a video located in the video library or specify a complete url for videos available online. If the Videos Manager is not visible you need to configure two applications settings in Mango.UI (Help videos URL and Help videos Share folder). Help videos is a seperate download. There are a couple of Admin Tools available at the Grid Management Pages. To get to the tools first use a browser to get to the info page of the grid. Normally you can just write the url for your grid and you will be forwarded /grid/info.html. Here is an example of a full address to a grid: https://myserver.company.com:19006/grid/info.html. Accessing this page will show the Grid information. Click on the web start link to download the Grid Management Application. In the Sign Installation Point tool you export and import the installation point manifest for signing. The installation point needs to be signed after every Smart Office framework update. If you just apply a hotfix with a feature then you don’t need to sign the installation point. 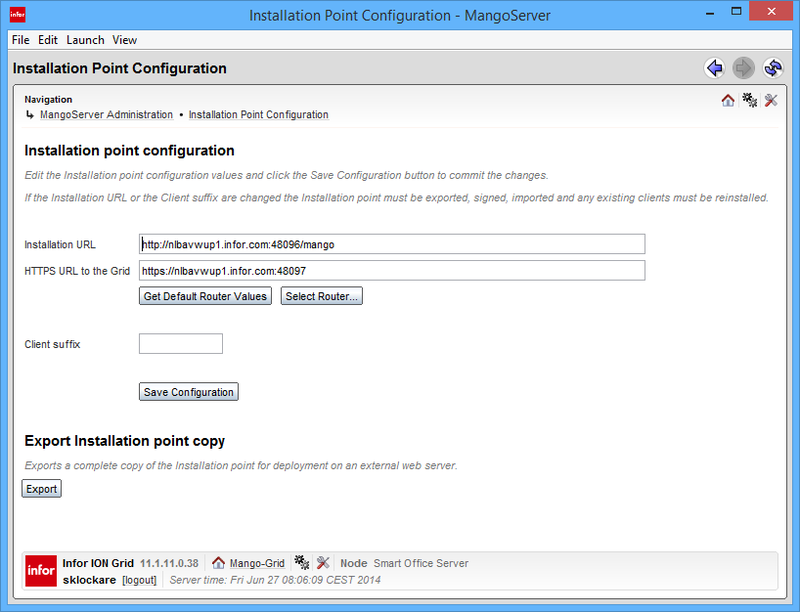 The Installation Point Configuration tool contains information that you have entered during the LCM installation. In this view you can export a copy of the installation point and change values for the Installation URL, HTTPS URL to the grid and Client suffix. If these values are changed you need to export and sign the installation point again. This is because the Installation URL and the Client Suffix are part of the applications manifest. 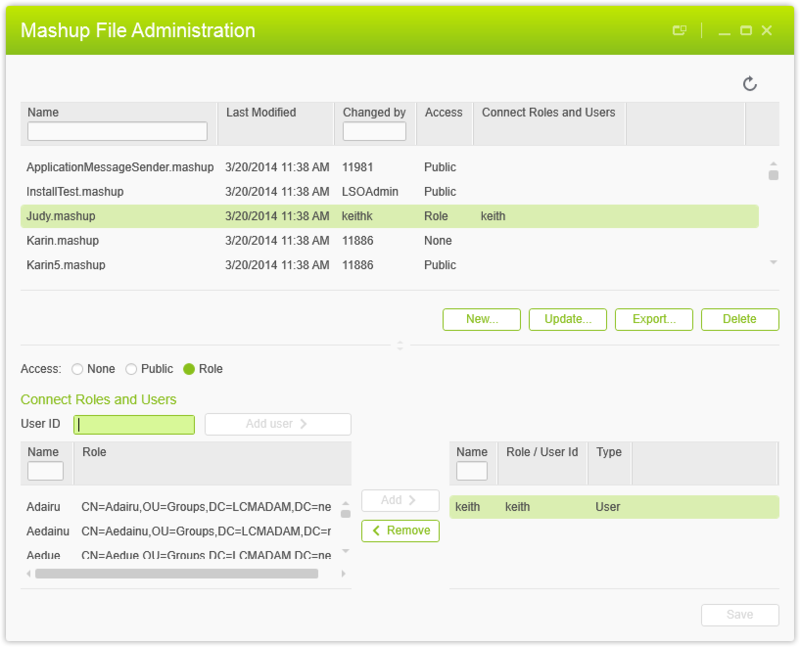 The install file can be used to deploy a .mashup or .lawsonapp directly without having to register it in LCM. 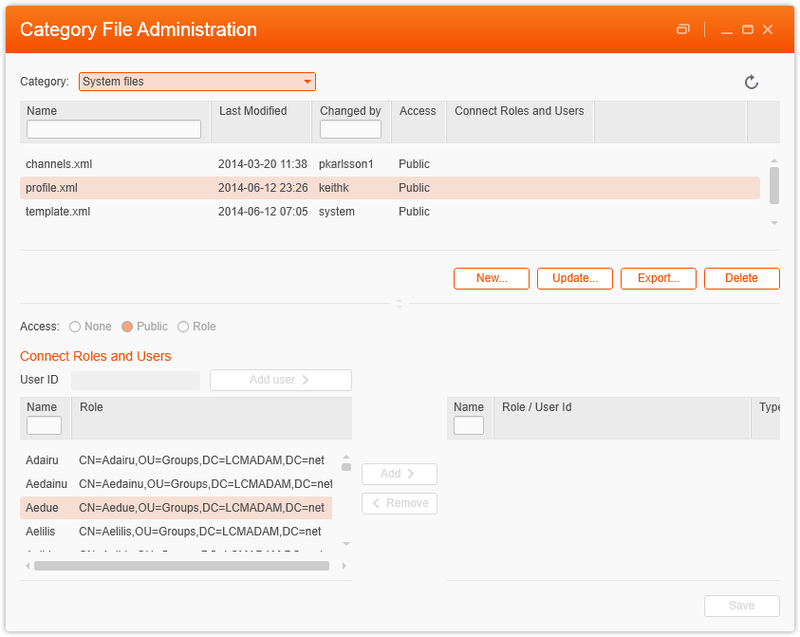 Even though you manage updates via LCM, you can decide to manage your own additional files (e.g. none Infor features) directly here. 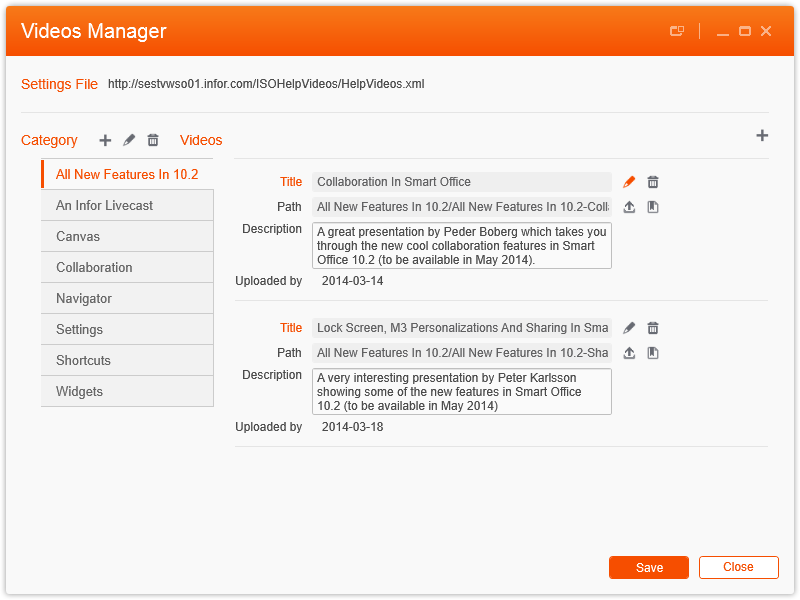 Browse to a supported file format and click install to install it on the Smart Office server. 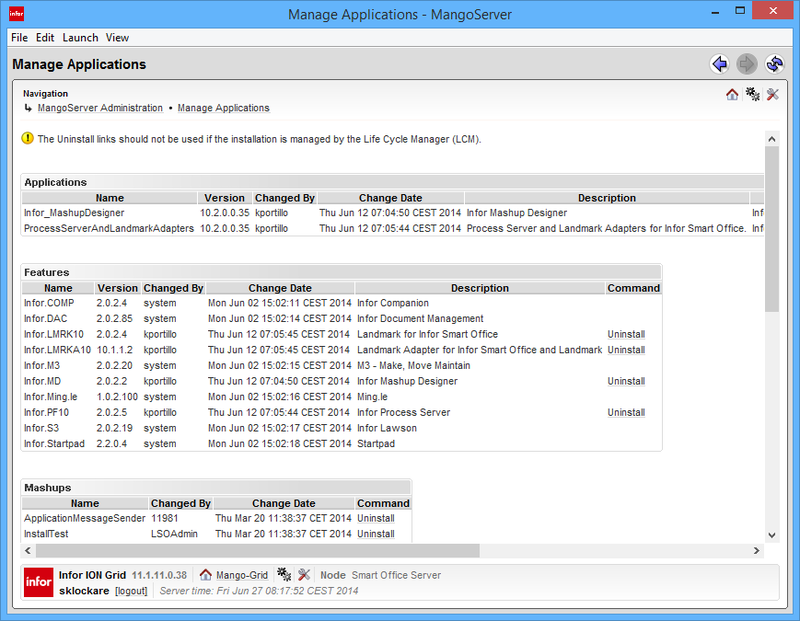 After installation, the component is visible in the Manage Applications management page. Install fix is for development only. This is used to install a zip file that contains a fix for Smart Office or a .lawsonapp (containing feature and mashup). Important: This management tool should not be used if you are managing the installation via Life Cycle Manager. 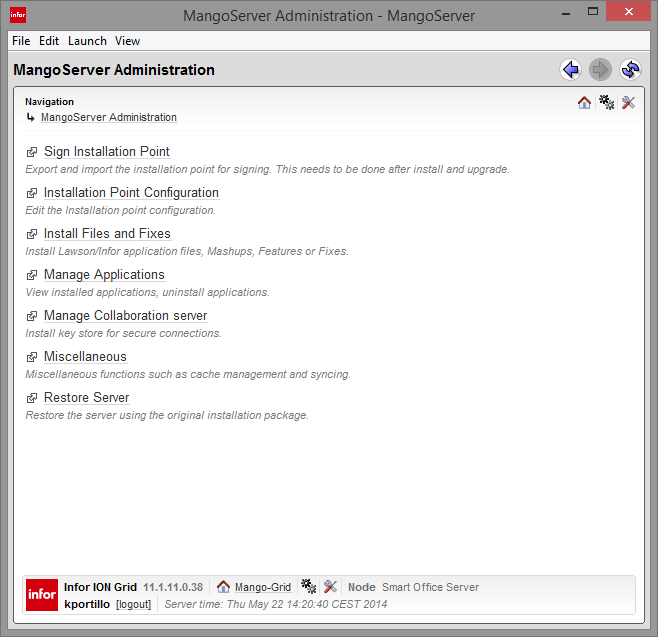 The Manage Application view provides an overview and a possibility to uninstall the installed applications, features and mashups on the Mango Server. You should not uninstall here if you are managing all your components via Life Cycle Manager. Out of the box collaboration (chat) is not encrypted with HTTPS. Manage Collaboration server contains functionality for uploading a keystore in order to encrypt the collaboration traffic. The collaboration functionality in Smart Office uses Web sockets to connect the users to the server. The Web sockets are not secured by default so any data transmitted using the collaboration functionality such as chat messages will be sent in a clear text over the network. If it is necessary, the communication can be secured by using secured Web sockets and an SSL certificate. 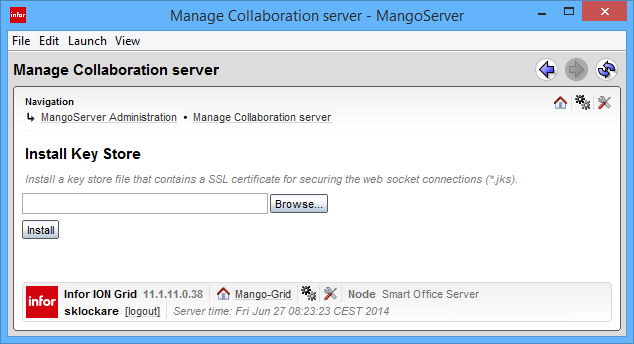 To enable secure connections for collaboration, you need to install a keystore file that contains an SSL certificate you also have to edit the collaboration properties in the configuration for the Mango application. In the Miscellaneous view you can clear the settings cache, synchronize features and installation point between database and disk and delete user data. Clearing the settings cache should only be done when a new user has been added to a group but the user does not receive its expected setting based on a set of rules. It is no longer allowed to do any changes to files on disk. If you have done changes or experienced issues with the installation point, you can press this button to sync all files from the database to disk. This does not affect files like the profile.xml or settings but affects the installation download page, the installation point, and the installed features and features folders. It is always safe to press this button but it is recommended that you do so during a service window to avoid concurrent file access. Delete user data affects all data for the specified user including settings, roaming files etc. It also means that the user will no longer be visible in the Collaboration/Chat functionality in Smart Office. The following tools are included in the Smart Office package but executes outside of Smart Office. Some of them are command line programs which are executed in the Command Prompt. The installation point must be signed with a code-signing certificate. Note that the code-signing certificate is not the same as the SSL certificate which is required to install Infor Smart Office in Grid. A code-signing certificate can be bought (recommended if Infor Smart Office is to be used over the Internet), issued by a certificate server (if used over an internal network), or created with the SignTool. Certificates created by the SignTool are self-signed certificates. 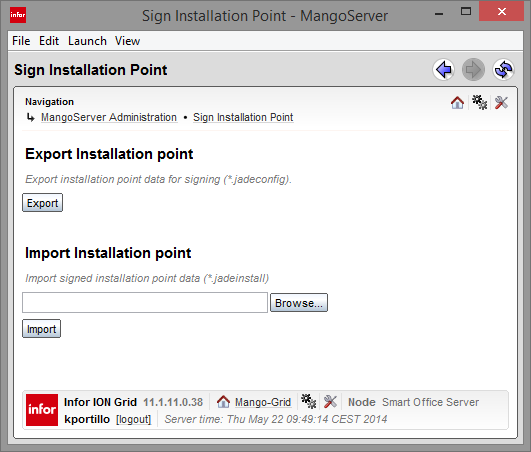 To sign the installation point, first export the installation point using the Sign Installation Point tool at the Grid Management pages. Locate the exported file and verify that the file has the extension .jadeconfig, if it doesn’t rename the file to set the correct file extension. Then you can launch the signtool.exe and follow the instructions to sign the installation point. This tool is launched by running the MangoAdminTool.exe file. To access this file, extract the files from the MangoAdminTool.zip. The zip file is included in the Smart Office install package (version 10.1.0.0 and later), and it is found in the AdditionalFiles folder. A command line version of the Mango Admin tool is found in the MangoAdmin.zip file. 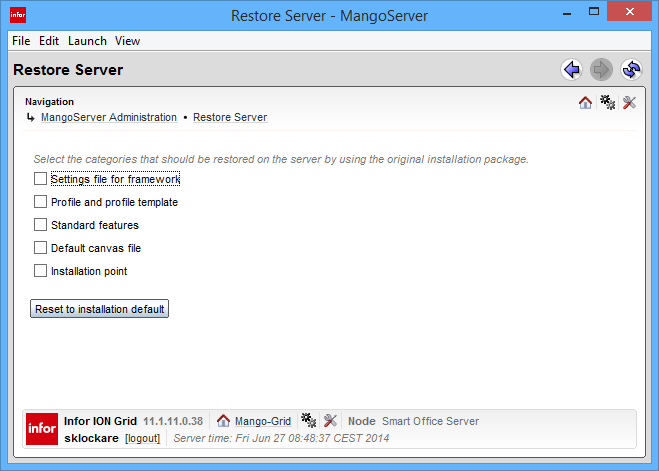 The Mango Admin Tool is used in the migration step and when it is opened you first need to select a server configuration in the Select Server Configuration dialog. Important: It is strongly recommended to export the data in a service window when no users are active. Data exported when users are accessing the system might be inconsistent. 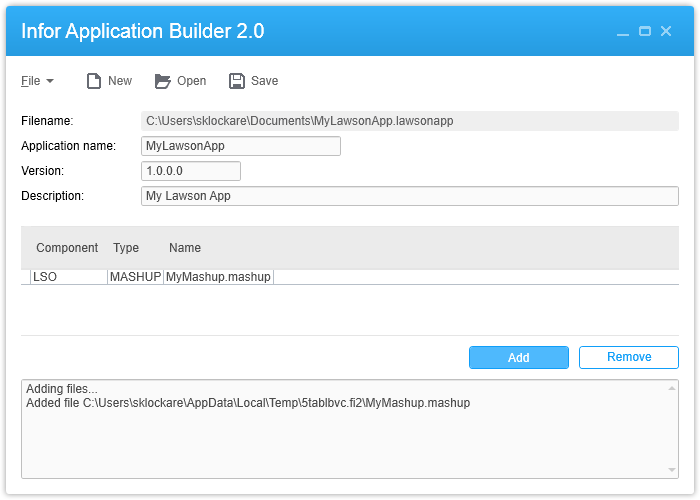 Lawson Applications (.lawsonapp files) can be created using the Infor Mashup Designer or the Infor Application Builder tool. For LCM 10.x users, you can change the file extension to .inforapp after you have created the application. 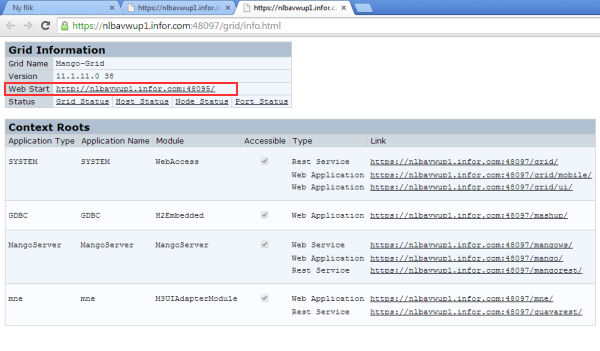 Note that .inforapp files are not yet fully supported in all different functions within Infor Smart Office. 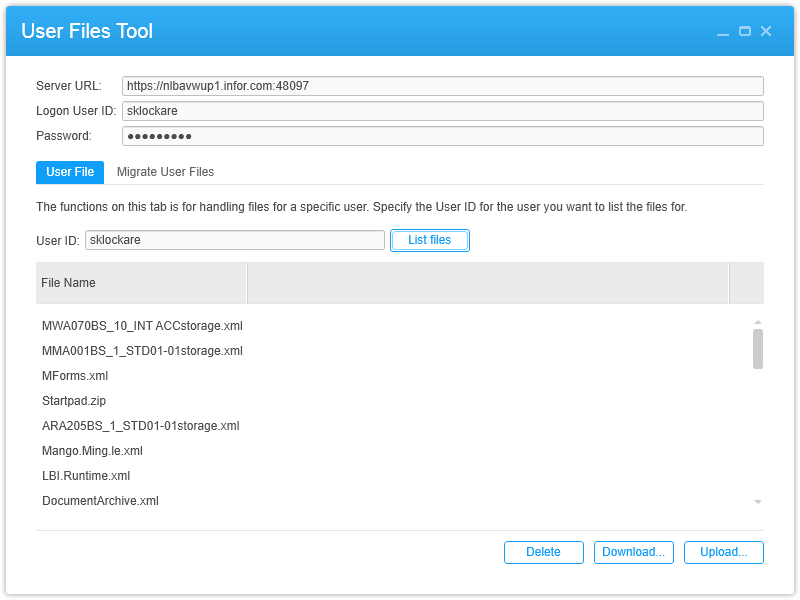 In the Migrate User Files tab you can migrate users’ favorites and canvas files from the file system in Lawson Smart Office 10.0.0.0 through 10.0.3.0 into the Infor Smart Office 10.0.5.0 GDBC database. The SettingsTool.exe is found in the AdditionalFiles folder in the Infor Smart Office installation zip file. SettingsTool.exe is a command line tool that you can use to export, troubleshoot, repair, and import settings files. You can use the Mango Admin tool for the same tasks as this tool. When a Click Once application is to be pushed out with a tool like Microsoft SMS, a small helper application must be used. The helper application is a small .exe file called PushClient.exe that takes the install point URL as a parameter. To install Infor Smart Office configure Microsoft SMS or any other tool used to execute the PushClient.exe once on every client machine the user logs into. The Infor Smart Office has some features that require elevation of the standard user rights to function properly in Windows Vista (and later versions of Windows that includes the User Access Control (UAC) feature). The features affected are the ones using sockets for communicating with the Infor Smart Office Framework such as Lawson Business Intelligence (LBI). To grant the rights to open the required sockets, namespace reservations must be made in Http system Access Control List (ACL). Read more about this in Infor Smart Office Administration Guide chapter Using Infor Smart Office with Windows Vista or Windows 7. You may want to have installation points on your intranet or internet. The External Installation Point Tool is used in a step for setting up multiple installation Points. Whenever you make changes to the original installation point, you must also update all of the external installation points. I searched for “Mashup not found” and looked into RemoveMashupInternalNameSpace but I still need more information. Seems like the template is moved. Exactly what template did you want to use? Please provide more information. The error indicates that a component is not in the correct location but it is hard to say more without the details. If this is a new mashup created by selecting a template in the designer it should definately be reported to support. If you are developing a mashup and trying to link different files the issue is within your mashup so please provide more info or report it to Infor Extreme Support. Don’t forget the client log it should show more information about the issue. I put together a list of ISO commands (mforms://, admin://, startpad://, dev:, internal://, Tool://) that I would like to share and extend with others, if possible. How can i share it with you? Great. I’ll send you an email and then I can create a post with it.